I’ll start with a disclaimer: I’ve always been a tree hugger. I stopped eating red meat because of information I learned at an Earth Day event decades ago. I reduce, reuse, recycle, and compost. And, I’m worried about what could happen to our planet as soon as 12 years from now. Have you seen the latest climate change news? We’re currently at 1 degree Celsius warmer than Earth was during the pre-industrial era. The latest report warns that we’ll be at 1.5 C above that level in only 12 years. The article points out that a change of “both 1.5C and 2C would take humanity into uncharted and dangerous territory because they were both well above the Holocene-era range in which human civilization developed.” But the difference is “1.5C gives young people and the next generation a fighting chance of getting back to the Holocene or close to it. That is probably necessary if we want to keep shorelines where they are and preserve our coastal cities.” So, we need to act quickly to slow the warming trend. I just read an article listing five things to do now for positive change. The fifth on that list includes some lifestyle changes. And, that brings me to the book I want to tell you about today: Food Is the Solution: What to Eat to Save the World--80+ Recipes for a Greener Planet and a Healthier You of which I received a review copy. The introductory sections of the book explain in length the problems with concentrated animal feeding operations and encourage plant-based eating for the health of the planet and the individual. But, the message is to “do what works for you – what tastes good and is attainable and sustainable in your daily life.” Giving up some meat and going plant-based even occasionally is helpful. It also gives everyone an opportunity to explore a more varied diet and discover some new and different dishes you maybe hadn’t tried in the past. Following the pages of information about air, soil, and water pollution with handy charts showing water use and emissions caused by the production of different foods, comes the fun part—recipes. Rice Pudding with Coconut and Cranberries sounds perfect for fall weather, and it’s made with coconut milk, cinnamon, and vanilla. I soak and puree cashews for lots of things lately, and that’s my current preferred way to make a Caesar dressing with no egg or cheese. But, I’ve never gone that route for mac and cheese. The Cashew Cream Mac ‘N’ Cheese recipe is about to change that. I also love the idea of Creamy Basil-Chickpea Lettuce Cups with capers and cucumber. Since I jumped on the carrot dog bandwagon over the summer, I’ve had plant-based hot dogs on my mind. I couldn’t pass up the chance to try the Loaded Black Bean Dogs. Making the hot dogs themselves is the focus of the recipe. 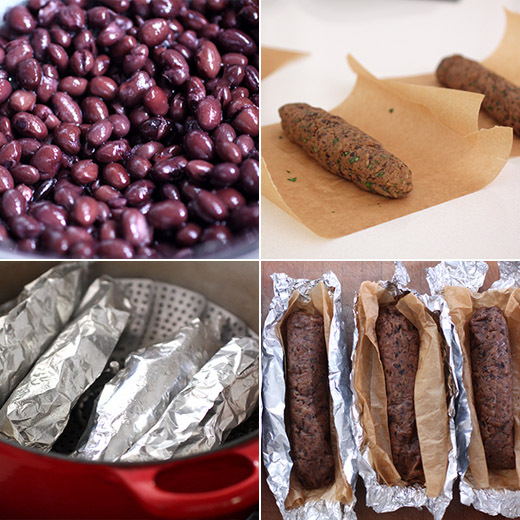 They’re made by pureeing cooked black beans with cilantro, olive oil, tomato paste, onion and garlic powder, smoked paprika, and nutritional yeast. Vital wheat gluten is added to bind the mixture. This was my first time using vital wheat gluten, and I had no idea how good of a job of binding it does. It’s very sticky once it becomes wet. The mixture held together perfectly. It was divided into four portions, and each was shaped into a hot dog. The dogs were wrapped in small pieces of parchment paper and then rolled in foil. The foil-wrapped dogs went into a steamer basket over simmering water and steamed for 40 minutes. After cooling, they were unwrapped and browned in olive oil in a skillet. Browning them on a grill pan would be great too. In the book, tomato and corn salsa is recommended for topping the dogs. 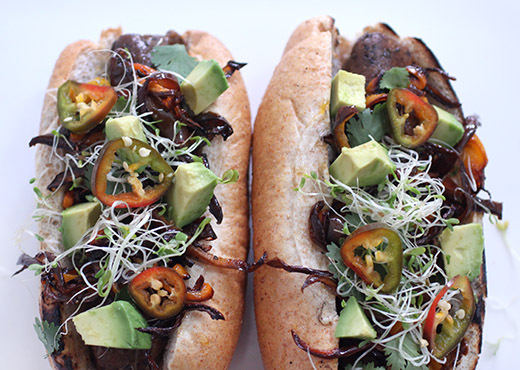 I used some sauteed sliced sweet peppers, sliced jalapenos, avocado chunks, sprouts, and cilantro. 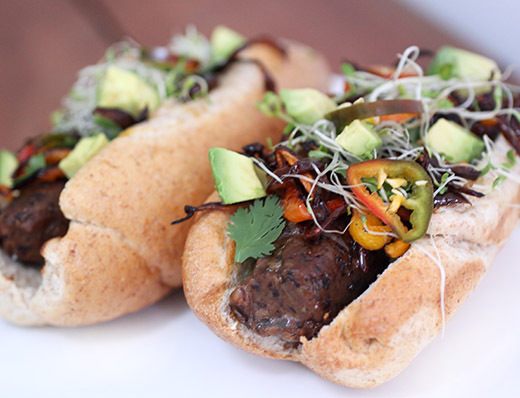 Knowing that beans require a fraction of the amount of water used to produce meat and cause far less pollution from emissions made these hot dogs even more delicious. Of course, the toppings here made the hot dogs amazing, but the texture and flavor of the dogs themselves were great too. I have a lot of fun experimenting with new-to-me plant-based recipes, and the reduced environmental impact of avoiding meat is a bonus. Back when I began learning to cook, which was way before I developed an addiction to cookbooks, I realized that I needed a basic baking book. I wanted a handy guide for making muffins, pie dough, cookies, and cakes. I wanted a greatest hits of general baking recipes with straightforward instructions that didn’t overcomplicate the process. If Rose's Baking Basics: 100 Essential Recipes, with More Than 600 Step-by-Step Photos had existed then, it would have been exactly what I needed. This new book, of which I received a review copy, is perfect for a beginner baker. It’s also an excellent reference for experienced bakers who want a book with all these classics in one place along with troubleshooting tips and “Baking Pearls” for each recipe. Each chapter begins with helpful solutions for common baking issues. For instance, I didn’t know that if your cupcakes turn out too flat, you should try resting the batter for 20 minutes before baking. The “Baking Pearls” give you specific information like the importance of weighing egg yolks and whites to be sure you are using the correct amount since their size can vary more than you might think. There are also all those step-by-step photos so you can see just what each step should look like along the way. This book gives you all the tools you need to succeed with baking projects. The yellow, white, and chocolate cake recipes are each offered in sheet cake and layer cake form and then in cupcake form. The leavening differs slightly for the cupcake versions. To top it off, there are some very tempting recipes to try. The Apple Cider Cake Doughnuts baked in a doughnut pan, The Glazed Mocha Chiffon Cake, and the Chocolate Cream Pie with a chocolate crumb crust are all on my to-try list. But when I read about the Butter Biscuits, I had to start there. 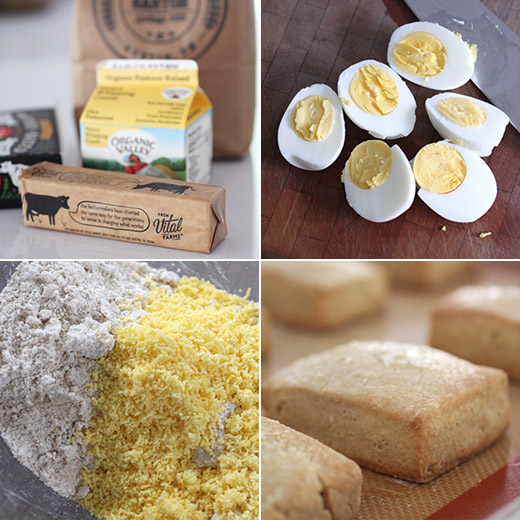 They’re made with hard-cooked egg yolks which was a biscuit recipe secret from James Beard. I've heard this before, and I've made cookie dough before with sieved hard-cooked egg yolks. But oddly, none of the biscuits in his Beard on Bread book are made with eggs so I don't know where the idea was first published. In the head note for this biscuit recipe, there’s a suggestion for using the biscuits for breakfast sandwiches, and I love breakfast sandwiches. If all of that wasn’t reason enough to try this recipe, there’s a side note for turning these into Angel Biscuits by adding some yeast to the dough. That was all I needed to form a plan. The unbaked biscuits can be stored in the freezer and baked just when needed. Or, if going the Angel Biscuit route, after the dough rises it’s then stored in the refrigerator for up to three days before being flattened, cut, and baked. Flour, baking powder, and salt were combined, and cold butter pieces were worked into the flour by hand. Hard-cooked egg yolks were pushed through a sieve and added to the flour mixture. The cooked yolks contribute to a more tender result since they mix into the dough without causing it to become gummy or possibly overworked. Cream was added next, and I added yeast as well. The dough was stirred together and left to rise for an hour and a half. Then, the covered bowl was placed in the refrigerator until ready to bake. I always get greedy when I make biscuits. I cut them into squares with a knife rather than using a biscuit cutter. I don’t want to waste any dough or have to handle it more for re-rolling. In this case, I got extra greedy because I wanted the biscuits to be wide enough to make a good breakfast sandwich. I rolled the dough a little thinner than I normally would and ended up with slightly shorter biscuits. I brushed the tops with extra cream and sprinkled on some flaky sea salt. To make the breakfast sandwiches, I made a vegetable frittata with local sun gold tomatoes and squash. 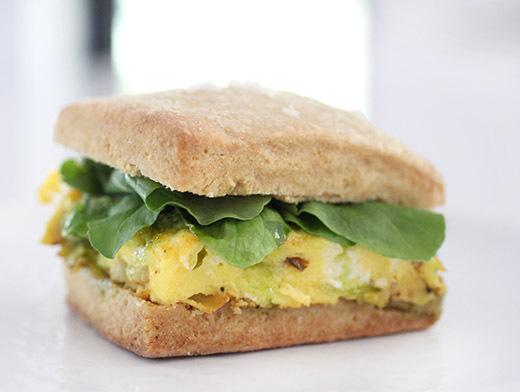 I cut the frittata into squares and topped the squares with basil pesto and arugula in each biscuit. 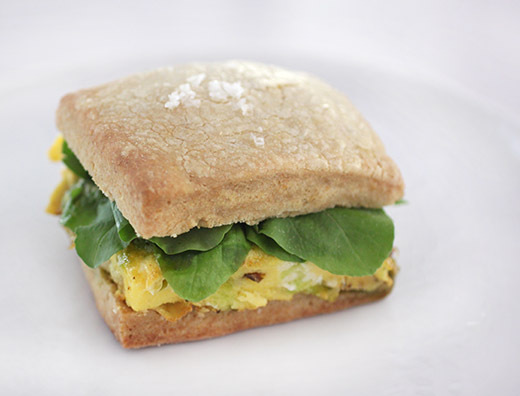 I loved the texture of these biscuits with the lift from the yeast and the tenderness from the hard-cooked egg yolks, and I’d love to keep trying new and different fillings in them for breakfast sandwiches. Although I started by saying this would have been the perfect book for me when I first started baking, I also think there’s always more to learn—especially with all the information packed into this book. And next, I’d really like to learn more about the Milk Chocolate Caramel Tart. BUTTER BISCUITS is excerpted from Rose's Baking Basics ©2018 by Rose Levy Beranbaum. Photography © 2018 by Matthew Septimus. Reproduced by permission of Houghton Mifflin Harcourt. All rights reserved. These biscuits are exceptionally soft, tender, and velvety. The secret ingredient is from James Beard, with whom I studied fifty years ago: hard cooked egg yolk. These are the biscuits I choose when I make strawberry shortcake or cobblers (page 250). They are also wonderful for breakfast, especially sandwiched with sausage patties. They are great to have on hand in the freezer, unbaked, because they can be ready for breakfast in under a half hour. -Into a small bowl, press the egg yolks through a medium-mesh strainer and cover. - Cut the butter into 1/2 inch cubes and refrigerate for at least 30 minutes or freeze for 10 minutes. - Thirty minutes or longer before baking, set an oven rack at the middle level. Set the oven at 375ºF/190ºC. 2.Add the sieved egg yolks and whisk them in to distribute evenly. 3.Stir in the cream just until the flour is moistened, the dough starts to come together, and you can form a ball with your hands. For angel biscuits, add 2 teaspoons (6.4 grams) instant yeast to the flour mixture. 4.Empty the dough onto a lightly floured counter and knead it a few times until it develops a little elasticity and feels smooth. Dust the dough lightly with flour if it feels a little sticky. Pat or roll the dough into a 3/4 inch high rectangle. For angel biscuits, place the dough in a bow and cover with plastic wrap. Set aside for about 1 1/2 hours. Then, refrigerate the dough for a minimum of 4 hours or up to 3 days. - Have ready a small dish of flour for dipping the cutter. 5.Dip the cutter into flour before each cut. Cut cleanly through the dough, lifting out the cutter without twisting it so that the edges will be free for the maximum rise; twisting the cutter compresses the edges, which keeps the biscuits from rising as high. Use up the remaining dough by re-kneading it only briefly, so it won’t become tough, and cut out more biscuits. 6.For soft sides, place the biscuits almost touching (about ¼ inch apart) on the cookie sheet. For crisp sides, place the biscuits 1 inch apart. Brush off any excess flour and, if an extra crisp top is desired, brush with the melted butter and sprinkle lightly with the sugar. 7.Place the biscuits in the oven and raise the temperature to 400ºF/200ºC for 5 minutes. Lower the temperature to 375ºF/190ºC and continue baking for 10 to 15 minutes, or until golden. An instant-read thermometer inserted into the center of a biscuit should read 200ºF/93ºC. If baking frozen biscuits, bake them at 375ºF/190ºC for the entire time for a total of 20 to 25 minutes. 8.Remove the biscuits from the oven and transfer them to a wire rack to cool until just warm, top side up. 9.Split the biscuits in half, preferably using a 3-tined fork. STORE: Biscuits are at their best when baked shortly before eating. They can be stored, tightly covered, for up to 1 day. To reheat, it works well to cover them with a lightly moistened paper towel and heat for a few seconds in the microwave. The unbaked biscuits can be frozen, well wrapped, for up to 3 months. Bake them without thawing.